One of the main objectives is to encourage people to change their transport habits and increase the share of sustainable mobility. Based on the mobility choices of the user, the application calculates the energy consumption for the mobility mode and gives points accordingly. Basically, the less you consume, the more points you get. When there is a certain amount of points earned, the user is entitled to different incentives, eg. at a local bike store. In Tampere technical stakeholders and end-users are actively engaged in order to design the services according to the user’s needs. The participants will evaluate the journey planner application and also give ideas for further improvement. In August a workshop will be organized, to have a discussion about the user experiences and evaluation of the application and its’ features. The feedback and suggestions for improvements from the users are an important part the development of the application. 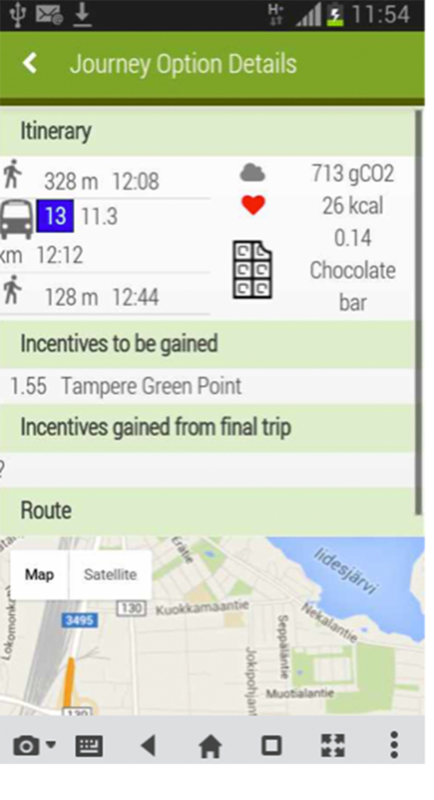 The Tampere pilot is developing a multimodal journey planner application that provides mobility information in an integrated way for the customer. The journey planner integrates walking, cycling, public transport and car route information and also shows the available parking spots for cars. The journey planner shows the CO2-emissions for the chosen mobility modes. The user gets points according to the mobility choices which can be then exchanged for different rewards. Multimodal journey planner with feedback from users; the multimodal journey planner is the “standard” function allowing to give the user indications how to go from an origin to a destination according to different modes of transport (PT, car, walking), Time to destination, Costs while receiving information on traffic congestion. The service will provide results in terms of criteria chosen such as time of travel, cost, energy consumption, carbon footprint, incentives, personal needs, etc. MoveUs platform provides the calculation of the emissions for each journey option offered by the system. This is done to increase the awareness of city inhabitants and tourist and allow them to make more energy efficient mobility choices. Based on the journey option emissions, green points are assigned to users to promote the more environmentally friendly options like walking or biking. These points can be exchanged for incentives such as discounts in local stores, by using the MoveUs app. In addition, Tampere City inhabitants can see their performance over time regarding green points, energy consumption and savings. The information is also transformed to different values like the equivalence in money, kWh, € and others, in order to allow the users to relate their performance to a meaningful value. MoveUs platform provides the calculation of the emissions for each journey option offered by the system. This is done to increase the awareness of city inhabitants and tourist and allow them to make more energy efficient mobility choices. Based on the journey option emissions, green points are assigned to users to promote the more environmentally friendly options like walking or biking. These points can be exchanged for incentives such as discounts in local stores, by using the MoveUs app. In addition, Tampere City inhabitants can see their performance over time regarding green points, energy consumption and savings. The information is also transformed to different values like the equivalence in money, kWh, € and others, in order to allow the users to relate their performance to a meaningful value. It’s a feature that helps the user to find available parking spots and thus reduces the amount of traffic in the city center. Today many of the initiatives that aims at triggering eco-friendly mobility choices are restrictive actions but it is likely that in the near future, a mix between prices, financial and positive social incentives could represent an effective measure to make drivers reduce of a significant percentage of the mileage in urban environment or to shift to other modes of mobility. MoveUs project has designed and developed a complete system where positive incentives can be gained by using ‘soft’ mobility modes such as shared vehicles, bicycle and public transportation. The three Living Labs in Madrid, Genoa and Tampere have developed custom incentive schemas and initiatives to fit the local needs and situation with the aim to achieve less energy consumption and smaller carbon footprint in urban mobility. This project has received funding from the European Union’s Seventh Framework Programme for research, technological development and demonstration under Grant Agreement no 608885.